City Hall outsider is the first Korean American ever to win a council seat. The results are in. 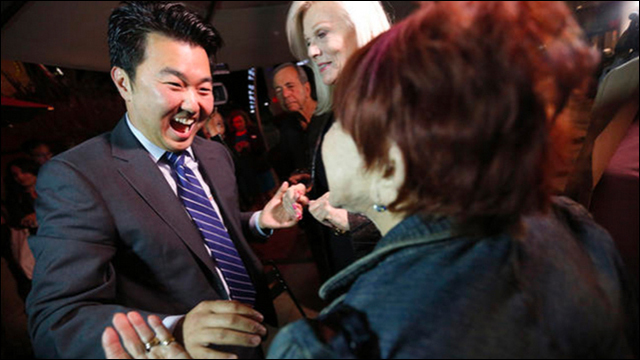 In Los Angeles, David Ryu has clinched a seat on the City Council, edging out opponent Carolyn Ramsay in District 4. The victory makes Ryu the first Korean American ever elected to the Los Angeles City Council, and the first Asian American to hold a council seat in over twenty years. With 100% of precincts reporting, unofficial results had Ryu securing more than 11,200 votes, giving him a more than 1,600-vote margin over Ramsay in the runoff to replace termed-out councilmember Tom LaBonge. Ramsay, chief of staff for LaBonge, had endorsements from Mayor Eric Garcetti and a majority of council members. Ryu, however, raised an energized base, casting himself as a City Hall outsider not beholden to entrenched interests. At Ryu’s campaign gathering on the front patio of Wokcano, an Asian restaurant on the Sunset Strip, dozens of supporters, staff members and volunteers watched election returns. Late in the evening, Ryu walked in to chants of "David! David!" "All the big names, all the established players were not with us,” Ryu told the crowd. “But we had something more important, something stronger — it was the community leader, it was the block captain." Congratulations, Councilman-elect Ryu. It's an historic win for Los Angeles.